Andrew Chen is a PhD Candidate in the Electrical and Computer Engineering Department at the University of Auckland. 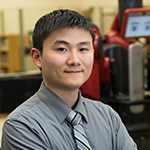 His research focuses on embedded vision - helping computers with constrained resources such as robots and surveillance systems see and understand the world around them in real-time. Part of this research also looks at privacy implications, and how we can use technology to better protect privacy and avoid abuse by system owners. He teaches computer systems engineering at the university, primarily in digital systems and software design, and supports robotics and civics education. He sits on the ICT and Auckland Momentum investment committees.